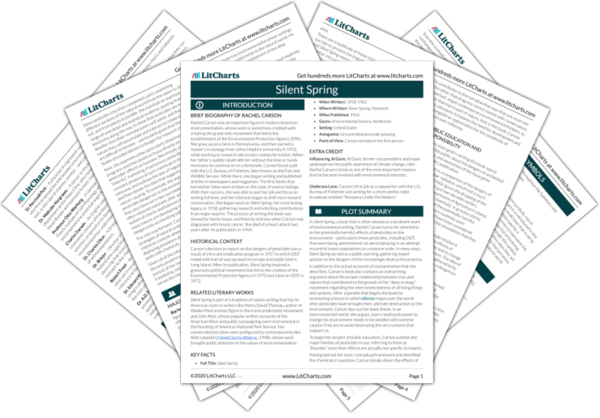 Instant downloads of all 942 LitChart PDFs (including Silent Spring). 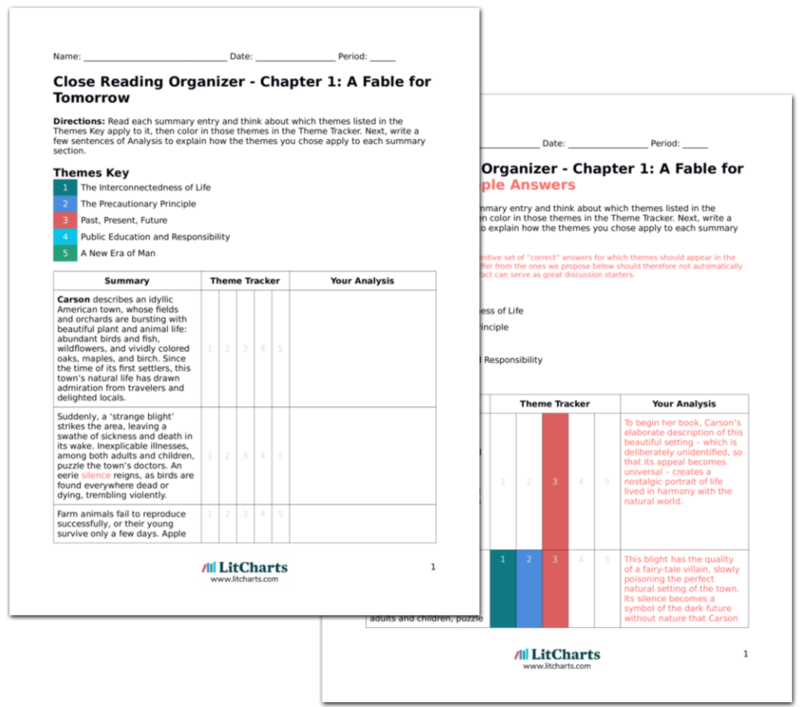 LitCharts assigns a color and icon to each theme in Silent Spring, which you can use to track the themes throughout the work. Man cannot exist without plants, but we have a narrow view of their usefulness and are quick to label them as undesirable – and attempt to eradicate them – if they serve no immediate, obvious purpose. However, each plant is part of a complex web of life, and the essential relationships between actors in that web should not be disturbed without careful thought. Unfortunately this is not the normal procedure with modern spraying practices. Here we see the new era of man – in which humanity feels empowered to shape its environment – confronted with the question of responsibility, and with its own limits. Who has the right to decide what in the environment is “undesirable,” particularly when that environment is one that has been carefully calibrated over millennia? The attempted eradication of the sagebrush from the West is a perfect case study. The sage is a result of long ages of experimentation by nature, and is perfectly adapted to its unique, harsh environment at the edge of the Rocky Mountains. It lives in concert with other creatures in its environment, like the sage grouse, a bird that, during mating season, loosens the soil beneath and around the sage so that grass can grow. This is another illustration of the interconnected web of species and environment that scientists refer to as ‘ecology.’ It also recalls the radical difference in the speed of man’s development, which is fast and furious, and nature’s, which is slow and careful. When one approaches the other, the fragile natural balance is disrupted. When farmers decided to clear away the sage with pesticides to create more grazing land, the other organisms that had grown up alongside it, including the sage grouse, the pronghorn antelope, and sheep, for which sagebrush was an important grazing material in its own right, immediately suffered. The grass that the sage had sheltered also disappeared, crippling the farmers’ plans. Further, without sage there was nothing for livestock and wild grazers to eat during the harsh winters. And here Carson demonstrates that disruption. Carson shows the ways in which violence against the sagebrush ended up harming the entire ecosystem, while the humans behind the plan failed to achieve their goal – in fact, their aims were also actively harmed by the eradication of the sagebrush, which turns out to play a key role for grazing. Another case comes from Supreme Court Justice and environmental writer William O. Douglas, who tells the tale of herbicide sprayings in Bridger National Forest in order to try to eliminate the sage. Untargeted spraying for sage also killed the willows, which had been home to the rare and wonderful moose, and disrupted beaver communities. Without the beaver dams, a beautiful trout lake at the end of the stream drained away, and this natural jewel and popular destination was lost. Carson’s citation of William O. Douglas gives her claims about the sagebrush new legitimacy from a prominent witness. His account is tinged with the nostalgic tone that Carson often adopts when remembering the past of a place, before pesticides disrupted the balance and led to the destruction of what had been treasured by many. 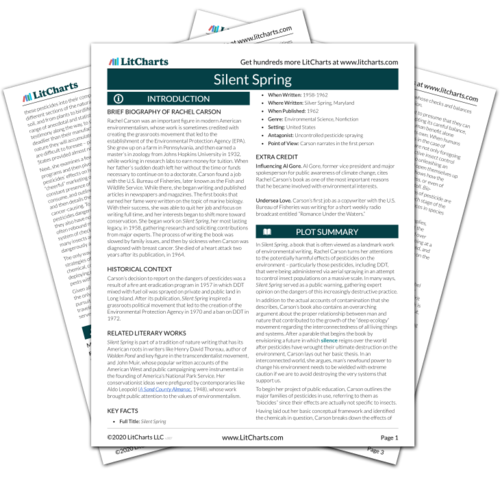 Get the entire Silent Spring LitChart as a printable PDF. Carson argues that weed-killers are tempting toys that appeal to those who want the spectacular illusion of power over nature and can believe in a ‘cheap’ alternative to mowing without considering true costs. One of these costs is in tourist goodwill, after beautiful roadside vegetation has been destroyed by the indiscriminate spraying of intolerant or careless weed sprayers, who view any brush at all as undesirable. In Maine, Connecticut, and Massachusetts there has been public outcry after spraying devastated natural undergrowth. Here, Carson continues to ridicule the idea that man can control nature without creating negative consequences, villainizing the sprayers of roadside weeds who have taken it upon themselves to destroy a portion of the forest with aesthetic value for many people, in addition to its ecological importance. The public seems united against these ‘sprayers,’ in Carson’s vision, and need only speak up for itself in a unified way. Carson describes with feeling one stretch of road she knows personally that which has been sprayed, with the exception of a few oases that now serve as painful reminders of the beauty that existed before. Why, she asks, must we consider all of this beauty to be ‘weeds’? She recounts another passage from the writings of Justice Douglas on sage lands, who eloquently defends the right of an old lady to question those who planned to destroy the sagebrush because their spraying would also destroy local wildflowers. We have a right, argue Douglas and Carson, to the aesthetic pleasure of natural beauty. Carson strays from the strictly scientific here into the realm of morality and sentiment. She evokes the beautiful past, with colorful wildflowers lining the roadside, to contrast it with the dead, brown areas that have replaced it in our present. Engineering nature, argues Carson, removes something beautiful and necessary from the human experience of the world – something which ought to be not only remembered and celebrated, but protected for the future. Beyond aesthetic considerations, there are practical reasons not to destroy so-called weeds. They provide the habitat for pollinating bees and other essential insect life, as well as animal life. Blanket spraying, in which whole areas are covered with a shower of untargeted pesticides often must be repeated when weeds return. Other methods, like smarter, selective spraying that only attacks unwanted, tall weeds, make use of the natural ability of persistent shrub cover to ward off the growth of taller weeds, and are therefore more effective and less disruptive. If taxpayers understood the inefficiency and danger of blanket spraying they would demand a change. In her role as defender of the natural world, Carson returns to the practical and lists the ways in which blanket spraying is less effective, more destructive, and ultimately more expensive than targeted spraying. The merits of targeted spraying stem from its understanding of the ecology of roadside vegetation, and Carson believes that the public, when educated, will be smart enough to see that these options are preferable. It is Carson’s explicit goal to provide this education. Herbicides like 2,4-D also have negative effects on livestock and wildlife that are not well understood. The herbicides accumulate in the soil, and can change a plant’s metabolism so that it produces more sugar and becomes more attractive to livestock – who can then be adversely affected (or killed) by eating the infected plant, which they might normally avoid. Moreover, the positive effects that certain ‘weeds’ have on the soil are underappreciated – we must remember that soil processes exist within a system in which many players participate. In Holland, marigolds that were planted among dying roses helped to control the spread of harmful nematode worms, a solution that has now been replicated elsewhere. By spraying without considering the many interdependencies at work in ecosystems, humans are changing the nature of wild habitats in unknown and long-lasting ways. Just because a certain plant is an annoyance to humanity, for whatever reason, does not mean that it serves no beneficial purpose for its neighbors. The anecdote from Holland is a perfect example o the ways that natural controls, like the marigold, can be used in place of herbicides. By increasing the diversity of flower beds, we would be moving away from an engineered, human-controlled state back toward nature. As proof that blanket spraying is ineffective, Carson considers the case of ragweed. Spraying ragweed does kill it, but the plant is an annual, which means that seeds sprout anew every year. And the new sprouts need clear soil in order to thrive. While blanket spraying kills the ragweed, it also kills everything else, providing exactly the open soil that ragweed requires to grow the next year, which then requires more spraying, etc. A better strategy for controlling ragweed would be to plant stable perennial vegetation, whose year-round presence would limit any open soil and serve to restrict the new growth of ragweed each year while also reinvigorating wild habitats. This is a prime example of the ways in which man’s quickly developed and poorly researched chemical approach to pest control can backfire when introduced into the complex web of interactions between species in nature. Carson offers a clear alternative that observes the example of nature and imitates its system of checks and balances. This option, rather than further destroying natural habitats, would strengthen them. Other intelligent, cheap, natural strategies for ‘weed’ control exist, including the importation of natural predators to control invasive species. Klamath weed, an incredibly fast-spreading invasive species in the American West, was controlled by an imported beetle. In a similar fashion, rampant populations of imported prickly pear in Australia were reigned in by an Argentine moth. These alternatives are far preferable, argues Carson, to the destruction caused by herbicides. In California, as we will see later, natural methods have been adopted with great success that could be replicated elsewhere. These methods take advantage of pre-existing predators, imported from an invasive species’ native zone to reintroduce a natural check that had been missing in the environment, naturally controlling the pest population. Lorenz, Ben. "Silent Spring Chapter 6: Earth’s Green Mantle." LitCharts. LitCharts LLC, 4 Oct 2015. Web. 22 Apr 2019. Lorenz, Ben. "Silent Spring Chapter 6: Earth’s Green Mantle." LitCharts LLC, October 4, 2015. Retrieved April 22, 2019. https://www.litcharts.com/lit/silent-spring/chapter-6-earth-s-green-mantle.